This brief tutorial will show you how easy it is to properly use a printer color profile from Photoshop CS6. If you're not familiar with what profiles are or why you should give them a try go here. On the Features tab, set your paper type - we tell you the right setting in the instructions that come with the profile download or on the download page. Note: The Red River Paper profile name will not appear in this drop down! Only HP paper types. Click on the Color tab. From the "Color Management" drop down, choose Application Managed Colors. 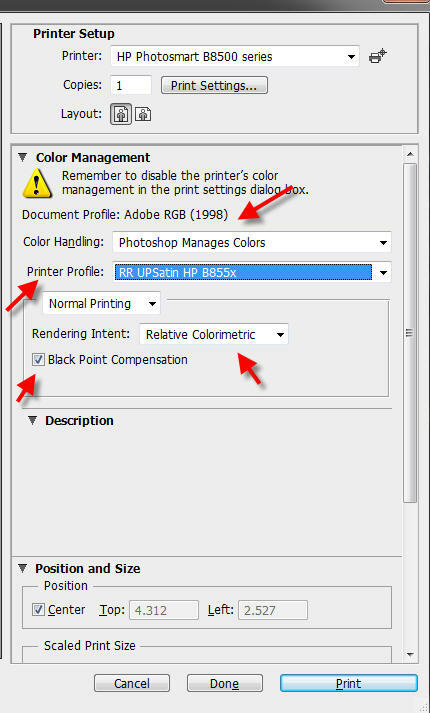 This instructs the HP driver to allow Photoshop to control color management.